The story and history of Saint Cyril. 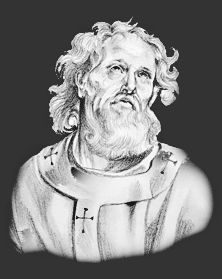 Cyril suffered while still a boy at Caesarea in Cappadocia, during the persecutions of the third century. He used to repeat the name of Christ at all times, and confessed that the mere utterance of this name moved him strangely. He was beaten and reviled by his heathen father. But he bore all this with joy, increasing in the strength of Christ, Who dwelt within him, and drawing many of his own age to the imitation of his heavenly life. When his father in his fury turned him out of doors, he said he had lost little, and would receive a great recompense instead. Soon after, he was brought before the magistrate on account of his faith. No threats could make him show a sign of fear, and the judge, pitying perhaps his tender years, offered him his freedom, assured him of his father's forgiveness, and besought him to return to his home and inheritance. But the blessed youth replied, "I left my home gladly, for I have a greater and a better which is waiting for me." He was filled with the same heavenly desires to the end. He was taken to the fires as if for execution, and was then brought back and re-examined, but he only protested against the cruel delay. Led out to die, he hurried on the executioners, gazed unmoved at the flames which were kindled for him, and expired, hastening, as he said, to his home. The Feast Day of Saint Cyril is May 29. The origin of Feast Days: most saints have specially designated feast days and are associated with a specific day of the year and these are referred to as the saint's feast day. The feast days first arose from the very early Christian custom of the annual commemoration of martyrs on the dates of their deaths at the same time celebrating their birth into heaven.